Earn $4.05 in Rewards credit (405 points) What's This? Tear up the course regardless of what today's weather brings with the Terreno Gravel tire from Vittoria. Featuring a tread pattern that shines in all conditions, ride with confidence regardless of whether you're riding in dust or mud. Whether today calls for a gravel grind or a muddy 'cross race, the Terreno Mixed Gravel Tire is ready to shred. 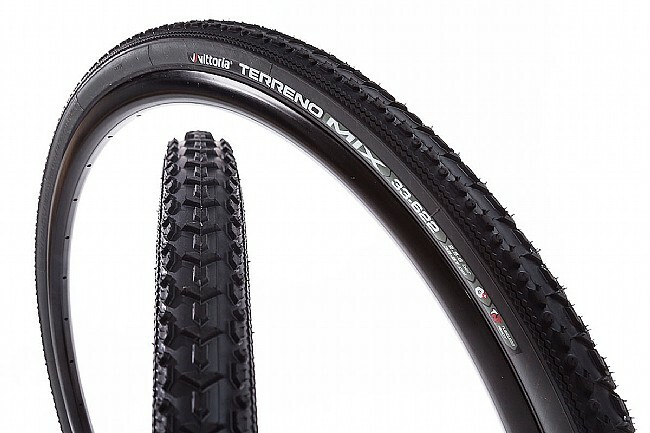 The Terreno lineup offers three separate variants catered to specific terrain conditions, but all three feature the Vittoria 3C rubber compound designed to optimize speed, grip, and puncture protection. Add in their Graphene technology and you get a faster rolling, longer lasting tire that doesn't shy away from wet weather. Lower your tire pressure and kiss flat tires goodbye with the 120 TPI TNT tubeless gravel casing, allowing you to take your tubeless-ready wheelset to the next level. All condition tread pattern features fast rolling center-ridges and open shoulder lugs. Available in three sizes: 700 x 31c, 700 x 33c, and 700 x 40c. 3C compound construction with Graphene provides a faster, grippier, more protective tire. 120 TPI TNT Gravel Casing.